As we look at pop culture it is vitally important for us to remember the gospel is the single most complete story of what pop culture emulates. The gospel resonates because it addresses the basic needs of all people: love, brokenness, the need of a hero, trust, and our longing for a happy ending. These needs are completely summed up in the Gospel. (see list below) In this series we are attempting to build on the foundations established in pop culture. Stories of love can be pointed back to God’s love, stories of brokenness, can be pointed back to our brokenness due to sin, and today we look at the stories that are created around the hero. 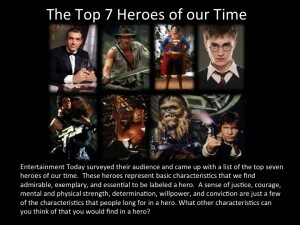 As Christians we are given an opportunity to speak into pop culture and point people to the ultimate hero. Jesus Christ. Consider the section of scripture found in Colossians 1. Does this sound like the type of hero the world longs for? Without our willingness to engage the culture and share the gospel the closest any individual may ever get to understanding what a true hero can be is James Bond or Super Man. Neither of which begins to compare to the preeminence of Christ Jesus. Jesus predates everything. His authority supersedes all things. Jesus fashioned every fiber of visible and invisible creation together. Jesus not only created everything, but without his desire for creation to exist it would cease to exist. We are alive today because he wants us to be. Because of Jesus sin and death have no power over the life of a Christian. This means we can walk in confidence knowing that our lives are at peace with the world, the heavens, and with God. All fame and glory are Christ’s and Christ’s alone. Not one thing is outside of his reach. Not one thing is more powerful than he. He is the ultimate hero. What hit home with you? Who do you know that you could share the gospel with, or build on their foundations with gospel truths? Take the time to let someone know how much his or her life has exemplified the gospel?